‘Provolone Valpadana’ cheese is a semi-hard, spun paste cheese, with a smooth crust, obtained from whole cow's milk with a natural acidity. It is rolled up and moulded thus having the shape of a salami, a melon, a pear, or a conical shape, or topped by a spherical little head. It is a cheese able to mature a long time without drying out excessively and therefore without becoming a grating cheese. There are two types of Provolone Valpadana: the sweet one with a delicate flavour, and the spicy with a stronger flavour. 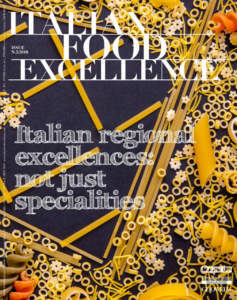 It must be produced within the whole area of the provinces of Cremona, Brescia, Verona, Vicenza, Rovigo, Padua, and Piacenza, as well as in a part of the provinces of Bergamo, Mantova, Lodi, and Trento. 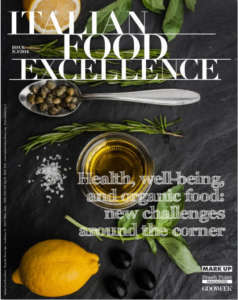 The natural factors are related to both the climatic conditions of the area of ​​production, favourable to both variety and abundance of forage cultivation, and maturation of the product in suitable environments. 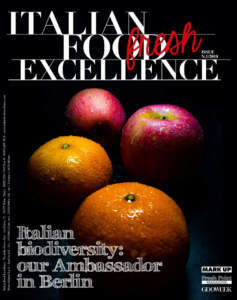 As for human factors, its consumption has spread for a long time in the production area of Po Valley, always keeping important markets in Central and Southern Italy, which historically are important consumers of it. In addition, its production technique has maintained the procedures established by tradition. Provolone Valpadana, in both its sweet and spicy version, can be either classic or smoked. The formats are extremely varied: the characteristic plasticity of the cheese paste during processing stage allows dairymen to produce cheeses in different weights. The product specifications of Provolone Valpadana have preserved this dairy culture by means of the identification of specific models of geometric shapes, proposed in different weights. There are four main forms of this product: salami, melon / pear, truncated cone, flask, which can be proposed in weights that range from a few hectograms to over a quintal. However, while talking with a cheese maker or a dairyman, it is unlikely that they talk about 'salami', 'melons', 'truncated cone', ‘flask’; rather, the salami shape will be referred to as 'Pancetta' or 'Pancettone’ or 'Salamino'; the melon/pear shape are indicated as 'Mandarino' or 'Mandarone'; the truncated cone is referred to as 'Gigante’ or 'Gigantino' or 'Gigantone'. Provolone Valpadana is also available in g 250 packs. These packagings can be proposed in different weights, too. 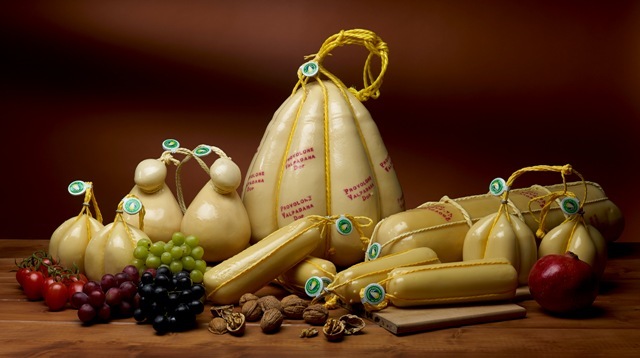 All packagings must indicate the correct caption ‘Provolone Valpadana’, the trademark which identifies both name and number of authorization issued by the producers association to every packaging centre which has an agreement with the association. 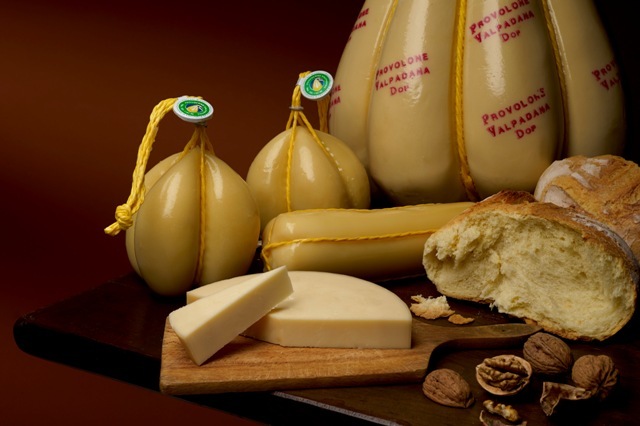 Provolone Valpadana is considered a ‘live’ food, which undergoes transformations over time. Therefore, it should be kept in a suitable environment, which corresponds to preferably dark, moist premises, and with a constant temperature, ranging between 6° and 7° C. In a home refrigerator, it is necessary to follow some useful tips: place the cheese in the least cold space, that is in the lower part of the appliance; always cover the cut side of Provolone with plastic film or aluminium sheet, wrap it in paper or a cloth in order to protect it from the light and put it in a plastic bag where some holes have been made. Avoid direct contact of different cheeses and to remove the cheese from the refrigerator an hour before serving it.